MSPs & Resellers : Cloud Optimized Data Protection & Application Mobility is finally here! Simple intuitive way to manage every customer. Dive into each customers deployment securely and view/manage DR Testing, Migration, Archival as-a-service. One platform, many apps - manage, monitor, apply IT business policies from the same management interface. You can automatically access our apps as we launch them on the AMP ™ platform. No re-install required. Easy! Want a detailed view of what is happening. It is easy to monitor details of the platform via out task viewer. Filter tasks by any field to quickly dive into what is happening when it is happening. Whether you are using storage locally or remotely in multiple locations, easily monitor & manage it from one place. Pay as you store makes sense! Optimize the utilization of your network with a click. Policy based bandwidth throttling & scheduling like never before. Easily set business and off-peak utilization policies. Get a micro and macro view of your infrastructure usage and get ahead of your budget planning! The easiest, fastest and most cost-effective way to deliver hybrid-cloud to your customers. Try Akumo Unity™ today. Our technology platform AMP™ manages itself - all you do is setup policies for your business use case such as migration, protection, recovery, archival, restore etc. You don't have to navigate the complexities of managing infrastructure in the virtual and cloud worlds. Our platform abstracts everything and operates autonomously. We have made a 'product' for what most businesses would otherwise consider a 'project'. You get to focus on your business consumers and their IT needs - leave the rest to AMP™. Our layers of orchestration make sure you only pay for what you use when you use it. We compute all the $$ behind the scenes so that you only pay the minimum cost to use the cloud. We dynamically build out what you need when you need it. No manual intervention - its all automated in our platform! Our platform offers simple policies to let you manage how and where your data and applications live. We implemented best practises of the cloud and your datacenter right into the product. 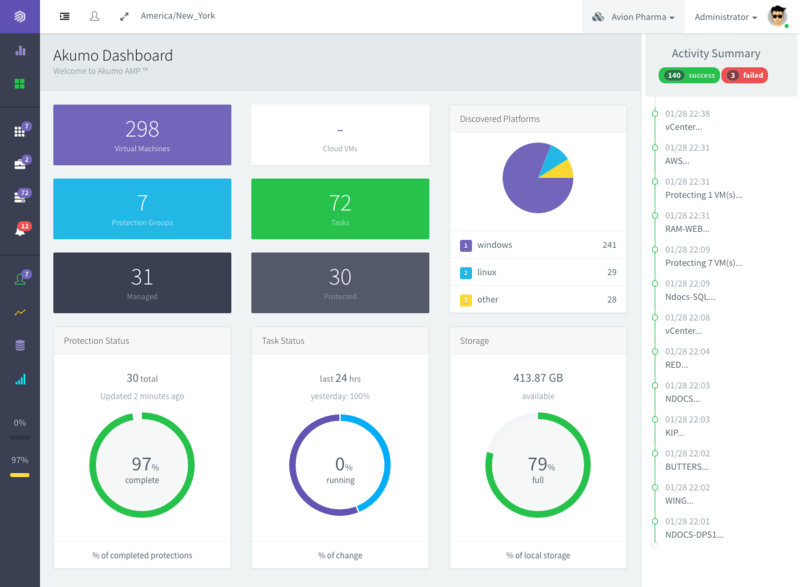 Our platform UI offers a very easy way to manage multiple deployments for MSPs or professional services firms who manage their customers datacenters. Whether you are running on-premise or in the cloud, our UI is always available where ever and when ever you need it. Our platform is all about simplicity. Set and forget. We try real hard to make any action you perform just 1-click. We strive to make our products simpler to use all the time! Migrate your virtual machines to/from the cloud. Protect & recover them for DR/BC into the cloud on-demand. Replicate them to other datacenters globally. Archive your filesystem data (CIFS/NFS/ZFS) between on-premise or cloud storage. Tier them to low-usage or cold storage via policies. Retrieve and pay-for what you need when you need it. Gain actionable insight into your datacenter and cloud environments. Determine costs up-front for managing your apps in the cloud. Create reports for budget cycles. Recover fully configured systems in the cloud in minutes. Protect more of your environment faster & for less. Backup or off-load old data from your expensive on-prem storage. 1-Click recovery of file-servers in the cloud. Assess costs of running your applications in the cloud. Run what-if scenarios for budgeting. Our team consists of veteran software architects and business executives from companies like VMware, AWS, F5 Networks, Akamai and Verizon Cloud. Join our partner program today - Are you a MSP or Reseller looking for ways to quickly monetize the cloud and add revenues to your bottom line without the added capital expense? Our partner program uniquely allows you to re-sell our products to your customer base without any support/operational expense on your part.